Dry-rubbed before grilling, the delicious bird is then generously drizzled with a zesty sauce at the table-twice the firepower for twice the fun. Arrange chicken in single layer on large baking sheet. Season with salt and pepper. Sprinkle chili rub generously on both sides of chicken; press to adhere. Let stand at room temperature 1 hour. Prepare barbecue (medium-high heat). When coals are white, drain chips, if using, and scatter over coals. Place chicken, skin side down, on grill rack away from direct heat. 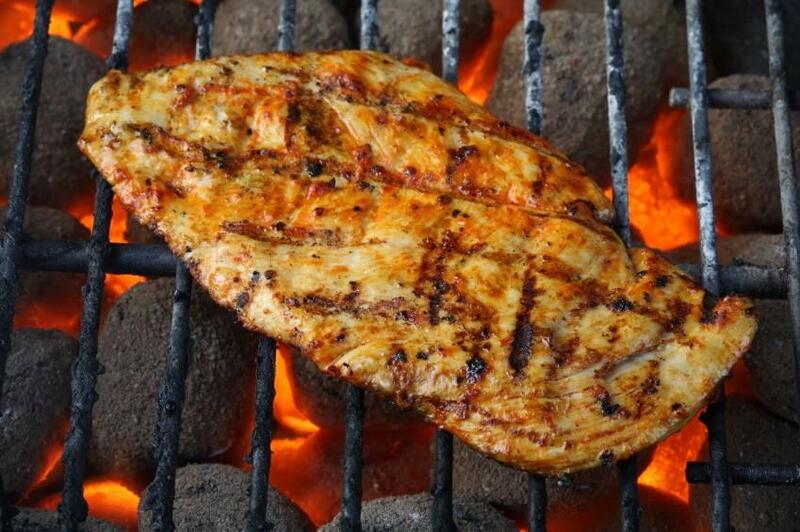 Cover grill and cook chicken until cooked through, turning every 5 minutes and covering grill, about 35 to 40 minutes (chili rub may look slightly burned). Serve hot or warm, passing mop separately.